Do you love connecting with the characters in your adventure games? The Longest Journey promises some of the most interesting characters you’ve ever seen in the point and click adventure genre. The game was released back in 2000 and holds an impressive low 90s score on Metacritic. 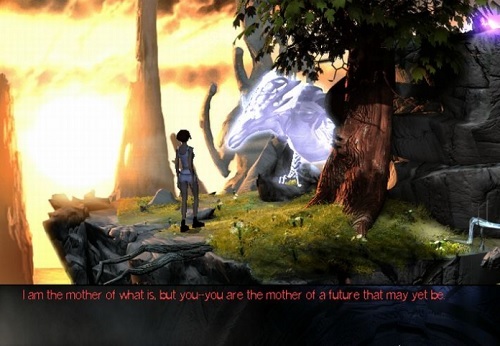 The Longest Journey doesn’t just offer impressive characters though it also has a multi layered and complex story to really get your brain thinking and keep you mesmerised in the game. The game is set in a number of parallel universes known as Arcadia which is dominated by magical users and Stark which is dominated by industry. The main character is April Ryan who is a simple student living in Stark with the magical ability to shift between the two very different worlds. Players join the story soon after April makes her first shift accidently into Arcadia while being asleep. Here she meets the White Dragon who tells her of the part she has to play in the coming adventure. Soon after this meeting April is attacked and shifts back into Stark believing the whole thing to be some strange nightmare. From here the story of the two worlds and April’s ability starts to unravel and takes players to a massive number of locations (over 150). Gameplay adheres to the point and click adventure game formula with players interacting with objects around the game world and using them to solve a variety of puzzles to move through the game’s story. The Longest Journey also makes use of long dialogue sequences to expand on the story and setting which add a lot to the game world compared to other games. With a huge number of locations, impressive character development and unique setting The Longest Journey is the definition of adventure game and definitely not a game to be missed by adventure fans. Released in 2000 for Windows. Complex story with plenty of levels to discovery. Shift between two different worlds. Classic point and click gameplay.